Fellow Brooke Bond collector Keith Lawrence has also kindly sent further information and thoughts on this set. In his collection Keith has an original magazine article dated August 11th 1956 showing the launch of Out into space in packets of PG Tips for the first time. This would mean that the "issued with" series would have had a six month life compared to the eight months or so for the "issued in" set, the latter would also have had a greater print run to allow for the greater sales of PG Tips. At the same time the Album had to be reprinted to include the the word PG Tips and this would explain why cards & albums from the original series are scarcer. As for card No 11, when the cards were printed it seems highly problable that there were stocks of sheets with the picture side only printed (i.e. 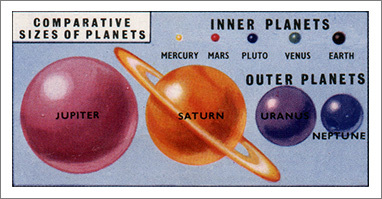 the Inner/ outer planets print) and that these were then used as the first batch of the "issued in " print run thus explaining how there are three varieties of this card and and why there are no "issued with" cards without the legend. A further thought; the official guide BB guide book states that a reprint was made available in 1958 and this would probably have been via the back issue order forms that came with new albums. Keith recalls Out into Space being available on a form for Wild Flowers 1st around the time of Wild Flowers 2nd, that is to say 1959. This does help fill in a few gaps and if anyone has the order forms from any series up to 1959 it would help to confirm this.